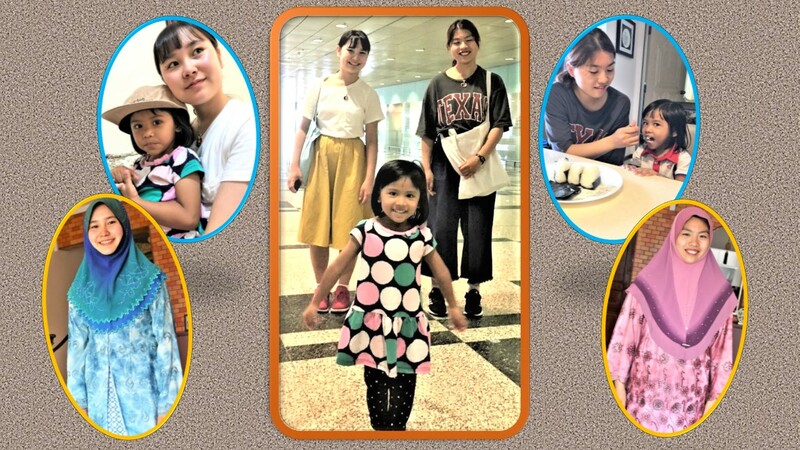 Iffah was with Hina and Yuki for only one day, yet it was an interesting day for her and them, Iffah affectionately calling them “Kakak” (elder sister in Malay). 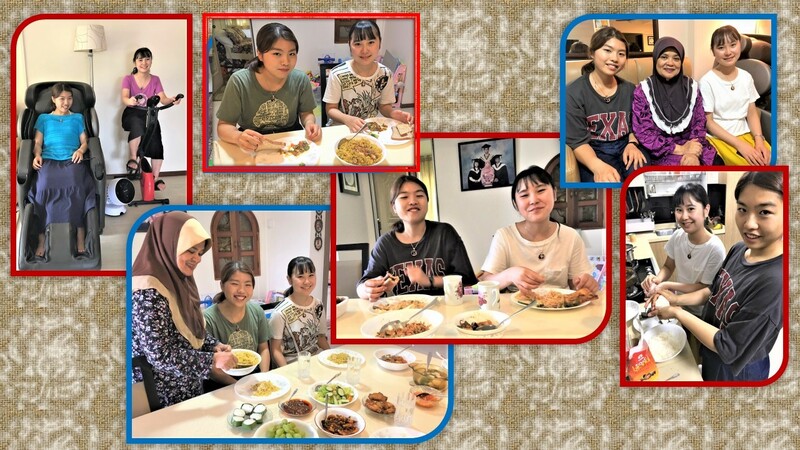 Ms Hina Dodo and Yuki Tsutsumi were in my home for three days, from Saturday 11 August (2018), staying for two nights for a homestay experience during their 3-week marine-study stint in Singapore. They are first-year students from the Tokyo University of Marine Science and Technology. 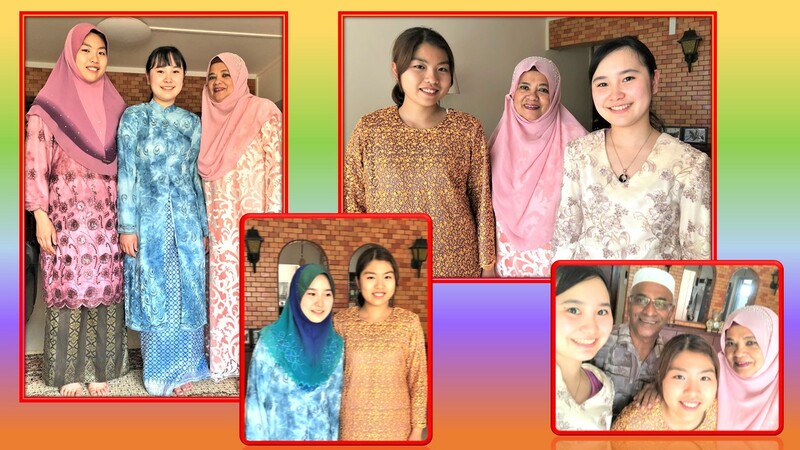 Iffah with her Kakaks (elder sisters), Ms Hinako Dodo (left) and Ms Yuki Tsutsumi. Iffah didn’t know of the coming of the Japanese students. It was a surprise for her when she saw them early in the morning of Monday, 13 August, the third day of their homestay, when her parents sent her to my home. 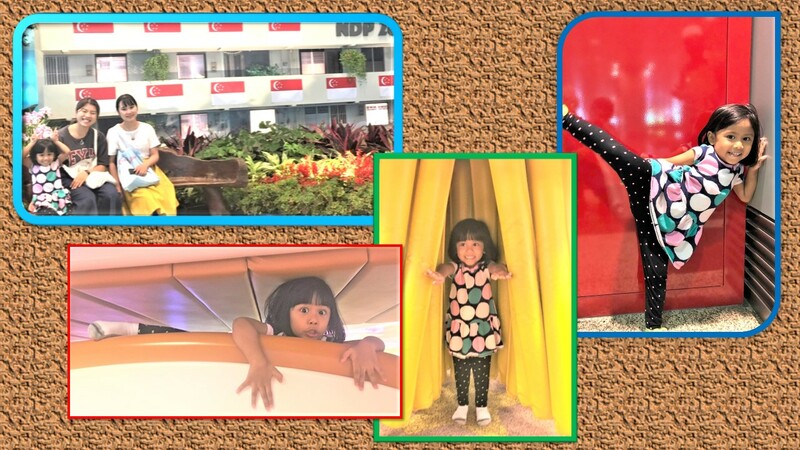 Nur Iffah Binti Muhammad Imran is my 4-year-old granddaughter who my wife and I look after during the day from Mondays to Fridays when her school-teacher parents, who live about 10-minute drive away, go for work. 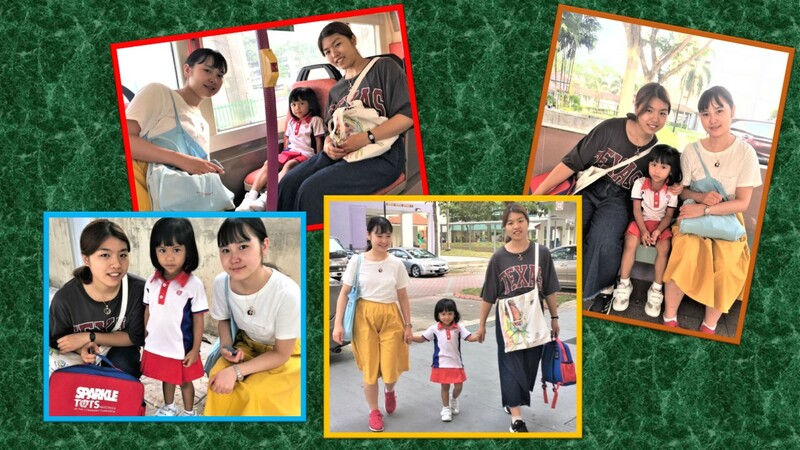 Iffah got attached to the Japanese “Kakaks” in the afternoon, after her 3-hour preschool programme at Sparkletots, till her parents came to fetch her that evening when all of us took my wife’s home-cooked dinner together. Our friends (from right) Mr Yacob Hussain showing thumbs-up and his wife, Mdm Keiko Soeda and Mr Imhar Said visited us to talk to Hina and Yuki. 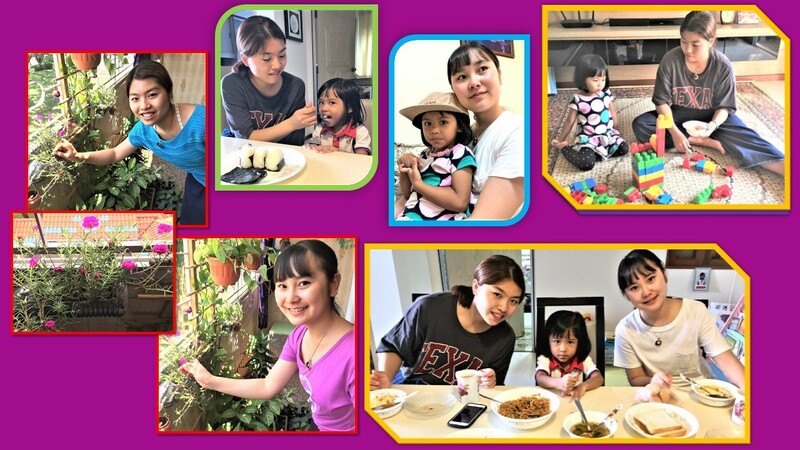 Relaxing at home…with Hina and Yuki learning to use fingers when eating food. 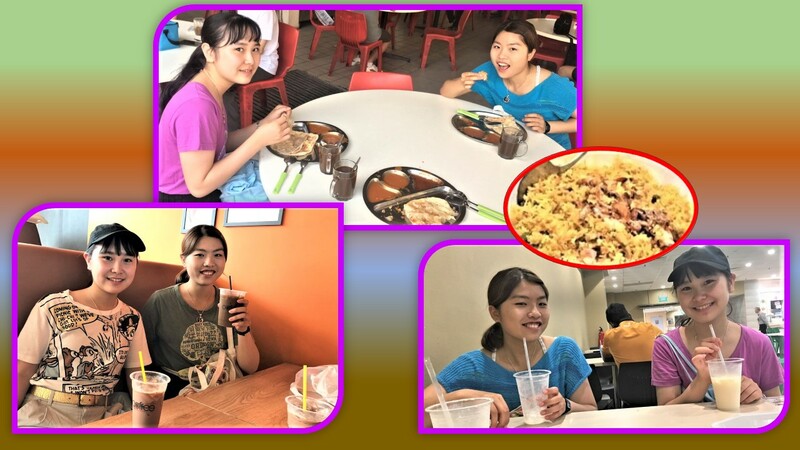 Second-day outing: Taking breakfast – the majestic prata, one of Singapore’s favourite breakfast dish – in a neighbourhood coffeeshop, and relaxing with cold drinks, Milo at National Stadium and soyabean at Changi Airport. And there is the all-time Singapore’s favourite rice – nasi goreng. Hina and Yuki journeyed by train, then by bus to the mangrove forest in Pasir Ris to look for King Kong but only saw King Fishers. 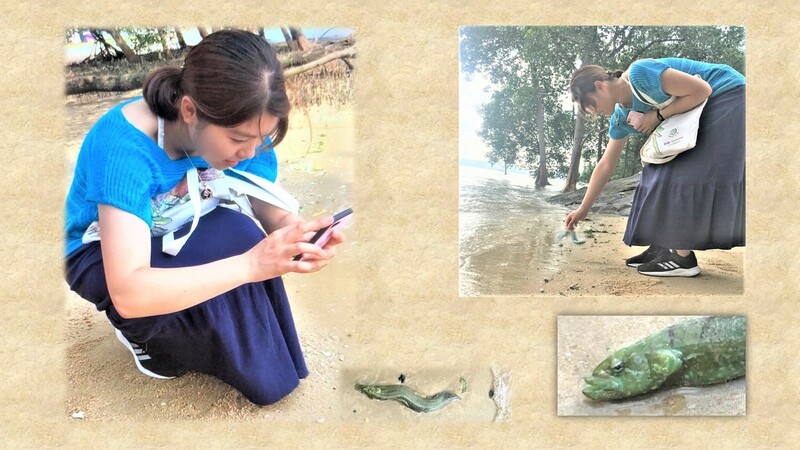 At Pasir Ris Beach: Yuki was fascinated to see a live eel-fish washed ashore by the wave. 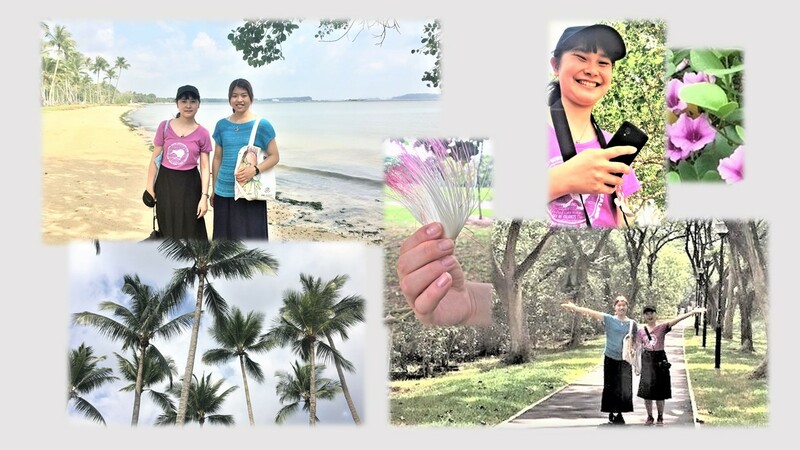 At Pasir Park: Hina is fascinated by the abundance of coconut trees and flowers by the beach and long paths leading to other attractions in the park. At the Pasir Ris Park: The beach park, located in the eastern part of Singapore, is one of the largest parks in Singapore and has a mangrove forest within the park with boardwalks that enable visitors to explore the forest. 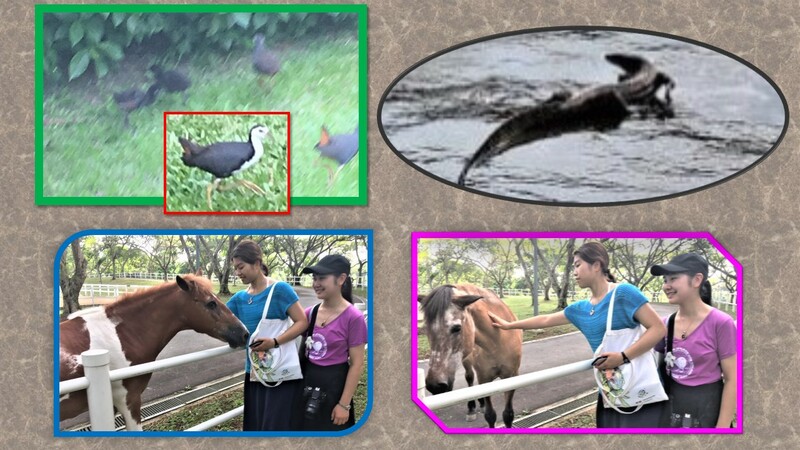 Hina and Yuki were excited to see various kinds of fish, mud-crabs, various species of birds like the long-legged white storks that flew and perched on the trees, and a monitor lizard. An evening at Marina Bay, an area with plenty of sights to enjoy like the Merlion and Theatres on the Bay or the durian-shaped Esplanade Theatres: A view of the Singapore Flyer from the Helix Bridge, a braid-like steel structure, and a splendid view of the iconic Marina Bay Sands (MBS) with Yuki “supporting” it on her head. 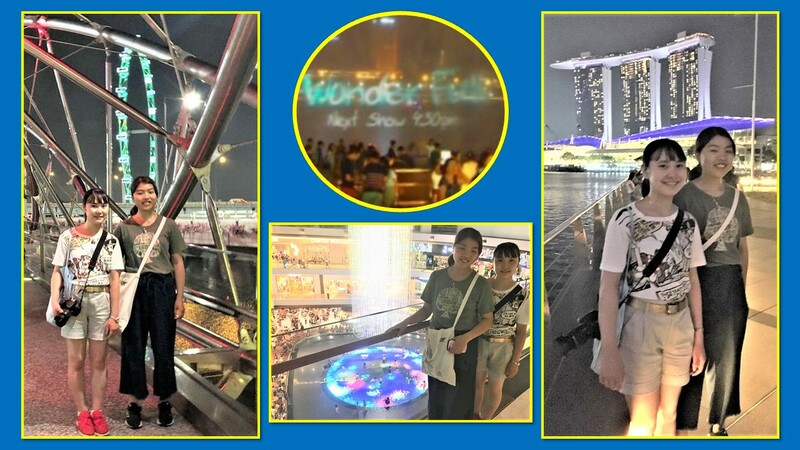 The young ladies also had an opportunity to watch the “Laser Light and Water” show in front of MBS and to tour the shopping complex in its interior. Relaxing at home…with Iffah warming up with her Japanese Kakaks. The Kakaks sending Iffah to school at 8:30 in the morning. The Kakaks fetching Iffah from school at noon and, at the same time, enjoying the neighbourhood. 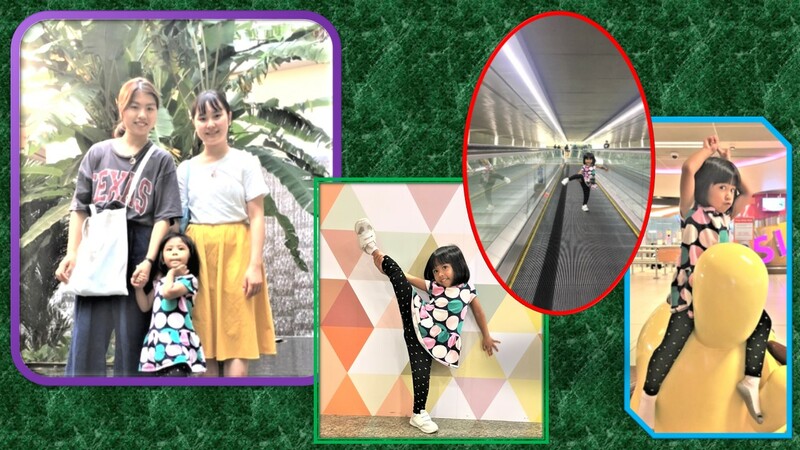 At Changi Airport, not to fly off somewhere but to relax and relish its beautiful sights with Iffah showing off her stunts and poses. 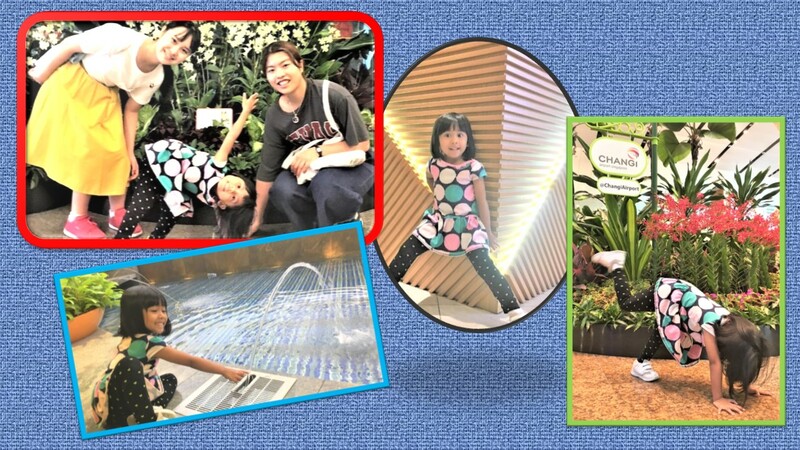 Enjoying the displays at Changi Airport with Iffah playing at the children’s play station. 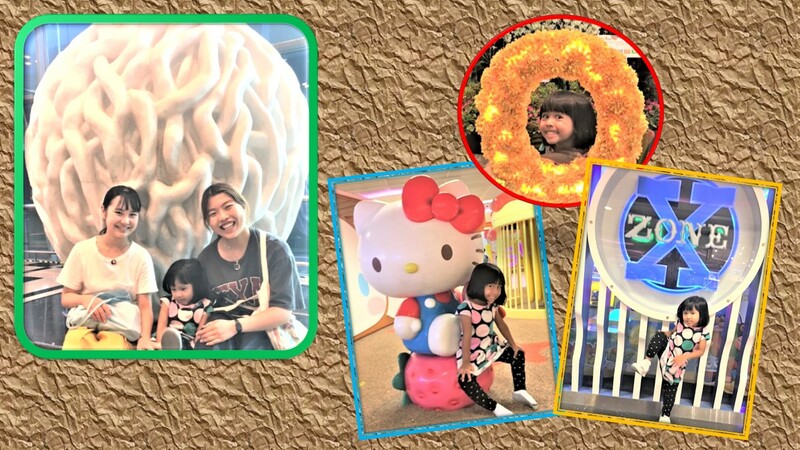 Changi Airport is a pleasant place to visit: The three girls love the place. Yes, Singapore is good. Thumbs up for Singapore. 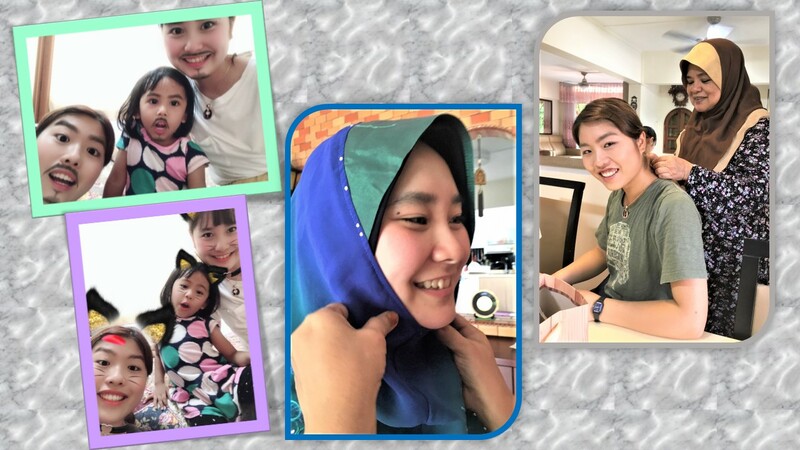 Fascinated with Malay attire: Hina and Yuki appreciatively wearing Malay dress, complete with the tudung (Muslim head-cover) for the first time. Many photos were taken to be shown to their relatives and friends back home. 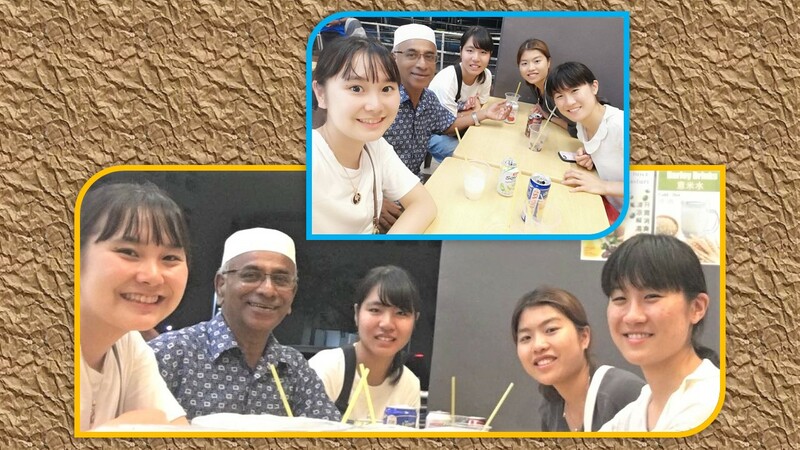 Only four students, all girls from the Tokyo University of Marine Science and Technology, came to Singapore for their 3-week attachment. 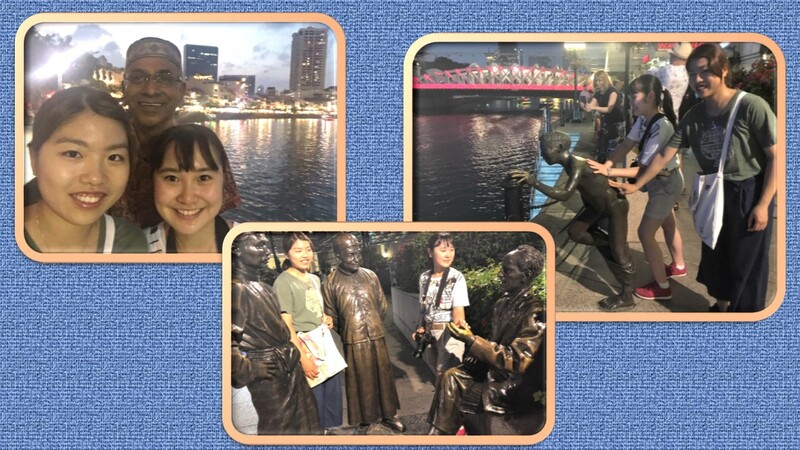 At the end of Hina’s and Yuki’s homestay with, and upon reaching the hotel, the students met up with the other two fellow-students, Sae (centre) and Sanami (extreme right) and we together had some cold drink. 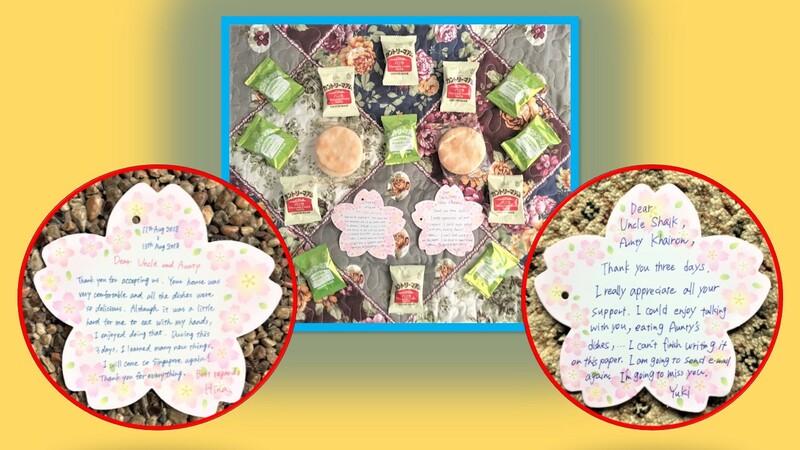 Showing gratitude for the homestay: Hina and Yuki had artistically laid “thank you” notes on the bed in their room to surprise us. 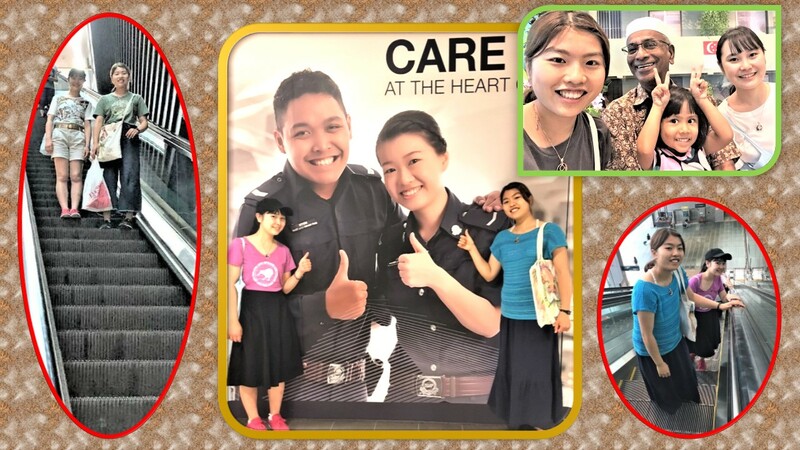 It is a joyful activity for us to volunteer our time and services to foreign students for the homestay programme during which they learn about Singaporeans and the interesting Singapore cultures. • Shelton International College Student Exchange Program. 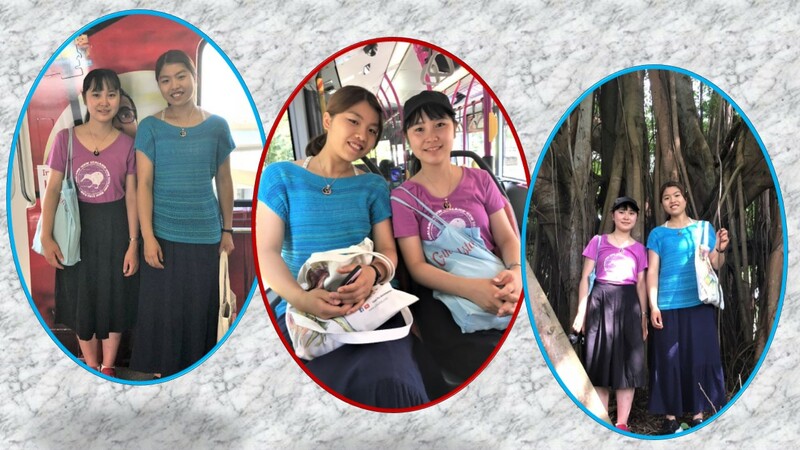 We must say we enjoyed taking them for the homestay stint just as much as they enjoy staying with us and learning a lot about our family lifestyle. This entry was posted in General interest (Wide-ranging) and tagged homestay, Japanese students, Malay dress, Marina Bay, Marina Bay Sands, Merlion, Pasir Ris Park, Tokyo University of Marine Science and Technology, tudung. Bookmark the permalink.